Sudan National Corp. for Antiquities and Museums (NCAM). 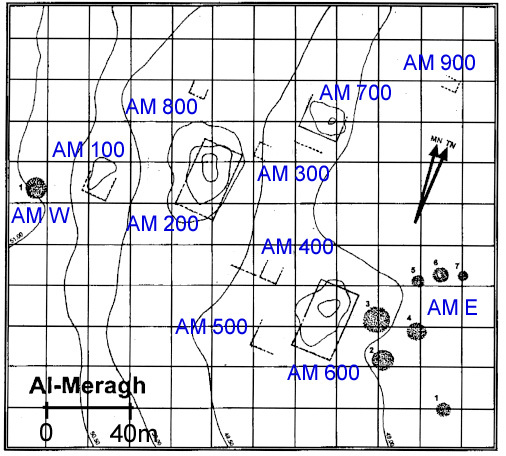 Because of the extensive settlement remains we were finding under cemetery AM E, it seemed logical to select AM 600 as the next large structure to explore, since it lay immediately adjacent to this burial ground. During my mapping of the visible buildings the previous December, I had discovered, based on the distribution of their stone fragments, that AM 600 and AM 200 were built according to the same plan. The only obvious difference between them seemed to be that AM 200 had formal stone doorways on its north, south, and east walls, while AM 600 had them only on its east wall. It also appeared that each building was symmetrical in its halves. I could thus be reasonably sure that if we could recover at least half of the plan of AM 600 this season (November 9-27, 2000), this would allow us not only to restore its full plan but also that of AM 200 with reasonable certainty. We started clearing the sand from the north end of AM 600 on and soon exposed a hard low mound of melted mud-brick, much like that of AM 700. Localized excavation around the shaft of one column over the next few days revealed that the ancient floor level lay 1.12 m deep and that the columns, within this very hard layer, remained standing to a height of two or three drums. The upper parts of the columns had toppled over and were scattered nearby, partly buried in the mud surface; their exposed elements were badly worn by wind erosion. By sweeping the surface of the mud mound, we were easily able to detect the lines of the original walls of the rooms and their doorways. In some places the walls were made even more conspicuous by the darker color of their mud. After clearing about 2/3 of the surface of AM 600 and tracing its walls, we were able to reconstruct its entire ground plan. AM 600 proved to be a large mud brick "duplex" containing two symmetrical luxury houses, built within a single enclosure wall 26.3 m, north to south, by 18.25 m, east to west (or approximately 35 by 50 Egyptian royal cubits). (Note that this width measurement is also identical to that of the exposed south end of AM 700). 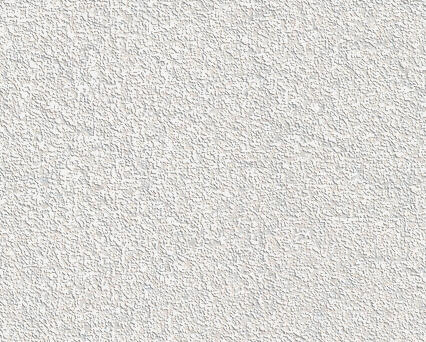 This outer wall, 1.09 m thick, had been entirely coated on the exterior with a thick white kaolin plaster, indicating that the house would have appeared white on the outside. A wall 70 cm thick divided the structure in half, creating on each side a separate house of eight rooms. 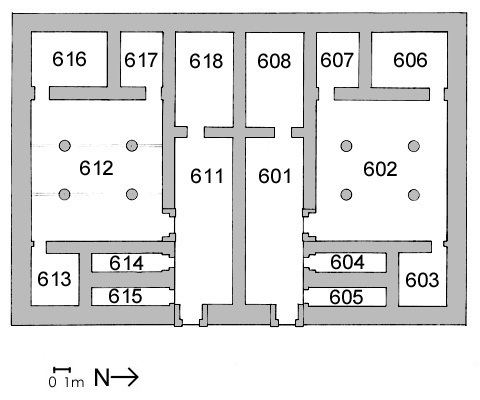 We numbered the rooms of the north house 601-608 and the corresponding rooms of the south house 611-618. Each of the house units had on its east side a front door. The doors of the respective units were 4 m apart, and each was framed by stone jambs and a lintel with cornice. Each opened onto an apparently roofless corridor 3 m wide and nearly 10 m long (601/611), which gave access to the various rooms of the house. The main room of each residence was an airy "loggia" or living room, 7.60 by 8.58 m in area (602/612), which was also entered through a formal stone doorway (rendered at the left). Its walls, like the exterior of the house, were plastered white, and will probably be found to have carried painted decoration. The ceilings of these rooms were supported by four stone papyriform columns, more graceful than those in AM 700 since they were one drum higher and stood 3.14 m. We can guess that the columned room 703 of AM 700 was identical in form to AM 602/612 and also functioned as the central living room of a private residence. These columned rooms would have been the highest in their respective house units and would have been lit by clerestory windows set in the walls above the level of the roofs of the surrounding rooms. Room 603/613 appears to have been a private room with a closing door, possibly a hamam with toilet facilities. The other two may have been bedrooms. The remaining three rooms of each house, it will be noted, were not connected to the living quarters at all. Room 604/614 was a long narrow enclosed space with its own door and has very much the look of a pantry or storage closet. Room 608/618, at the west end of the corridor, was probably a kitchen. (rendered here below; click on the image to enlarge). It was walled off from the rest of the house probably to keep the living quarters free from the smoke of its cooking fires. Based on modern Sudanese parallels, we may imagine that it also had a light roof, perhaps only grass mats or palm branches aid across rafters. This would have allowed the escape of smoke but would have provided shade for the cook. Finally, room 605/615, which we found to be partly filled with transverse brickwork, appears to have encased the stairway to the roof. These houses, with their central 4-columned halls, bear striking similarity to many ancient Egyptian houses of the New Kingdom. At the same time, they are also remarkably similar in many respects to modern Sudanese houses. Based on comparisons with both ancient and modern parallels, AM 600 can be quite convincingly restored. It must be emphasized, however, that these renderings are only tentative and will surely be modified as we learn more. The rooms of these houses are buried in hard-packed dried mud to a depth of from 60 cm (at the perimeter) to 120 cm (at the center), and this made any digging inside the rooms extremely difficult. Nevertheless, with more time in the future, all the rooms could be cleared to floor level and many objects will doubtless still be found in situ. Hopefully we may even find well-preserved remnants of painted wall decoration. We were able to penetrate to the floor level in only one small area beside the standing shaft of the southeast column in Room 602. It was this trench that allowed us to establish the depth of the floor and restore the form of the complete column; it also allowed us to discover again evidence of the conflagration that seems to have overwhelmed the entire town. On the floor was a layer of ash and charcoal similar to that we had found in both AM 700 and in all the buildings observed under AM E. We were able to take ample carbon samples and will run these as soon as possible. author: Timothy Kendall & Learning Sites, Inc.
© 2001-2007 Learning Sites, Inc.